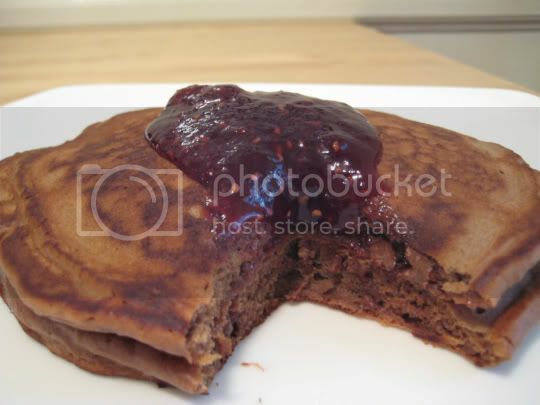 I didn't exactly flip (no pun intended) for these pancakes, but they are good, very filling, and easy to make. These are EXTREMELY decadent, heavy, and rich for a morning breakfast, and even a side of eggs or some kind of meat alternative almost seems too much to eat with them. The perfect complement? Fruit...raspberries or strawberries. I used a dollop of raspberry jam here (although I think the lightness and creaminess of whipped cream would have been a little better), and the raspberry-chocolate combination was wonderful. Maple syrup would have been too much for these. Surprisingly, the chocolatey flavor was not overly pronounced, and they weren't super sweet either. My favorite thing about these pancakes was the intermittent burst of milk chocolate from the chocolate chips in the batter. Oh, and have a nice cold glass of milk nearby to rinse these down. Make again? Yes, served with whipped cream, and made silver-dollar sized (the recipe made about eight 6-inch pancakes...and two per serving is MORE than enough).